On Saturday afternoon, a group of GAA journalists found themselves outside the White House on a day when the flags flew at half-mast to mark the death of the 41st US President George H W Bush. Try as they might, they couldn't keep their minds on what was in front of them. Instead, they were deep into a conversation which started the previous day when Donegal's Ryan McHugh gave a chilling insight into the nature of the multiple concussions and bleed on the brain he suffered during the 2018 county season. Not only that, but another knock in a challenge match against St Vincent's of Dublin convinced him to sit out the rest of the club season. McHugh's injuries were not known at the time but, on reflection, the motivation for county manager Declan Bonner's dogged insistence mid-summer on protection for his player now becomes entirely understandable. The dilemma McHugh finds himself in is alarming. Two Ulster titles and two All-Stars already won, he is merely 24 and one of the most exciting footballers in the game. What would you do? It's a dilemma that journalists wrestled with in front of the White House. One wondered how much longer it might be before scrum caps became common in Gaelic football. Discussions of changing the tackle laws - or even clearly defining them in the first place - hummed along. In choosing to be so open about his injuries, McHugh has done the game significant service, and his comments add further material for the serious work that is ongoing in the GAA on this problem. It came as no surprise, though, that these comments were made during an All-Stars trip in the comfort of a Philadelphia hotel lobby. This is not the sort of thing players will ever disclose over the course of a season. And if some are suggesting the future of All-Stars tours is in doubt, they serve the function of broadening discussions within the GAA quite perfectly. In what other setting would you see Kerry's David Clifford, just one year into his career and after collecting an All-Star, relaxing into his first major sit-down interview and revealing that his childhood hero growing up was not actually Colm Cooper or James O'Donoghue, but indeed Jamie Clarke of Armagh and Crossmaglen? That might go some way to explaining the audacious turtleneck sweater at the All-Stars awards night then. The notion that persistence is awesome is well embodied by Tyrone's Colm Cavanagh. 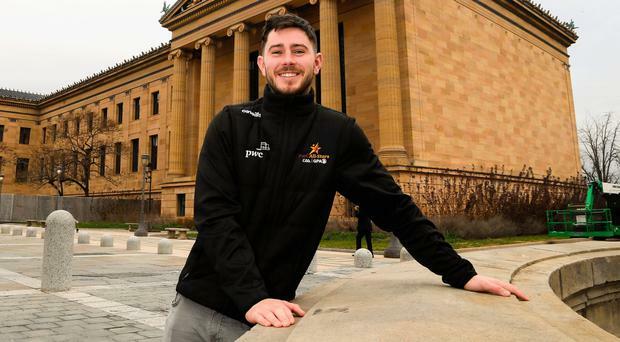 For the first part of his county career he was seen as some sort of an ugly duckling when held up against his older brother Sean, but the last few years have seen a spectacular flourishing of his talents, rewarded with All-Stars in the last two years. "Yeah, it took me a few years to probably nail it," said the Moy man. "I probably took plenty of flak in the early stages with Tyrone, took a lot of abuse on… it wouldn't have been social media, it would have been message boards at the time and I would have been well aware of that at the time. "In one way I have to appreciate that Mickey (Harte) did stick with me the whole time because he obviously saw something there and it took a wee bit of time to tease it out." When you are part of such a candid series of interviews, it can be tempting to think this is the natural flow of things. The in-depth feature interview with former Kerry manager Eamonn Fitzmaurice soon disabused us of that thought. There was a lot in the piece, but one thing that jumped out for every journalist was how Fitzmaurice inferred that over the last few seasons he lost something in the rivalry between himself and his Dublin counterpart Jim Gavin, because he answered some questions truthfully. "What Jim does differently, and successfully, is say nothing, nothing at all, over the winter time," said Fitzmaurice. "Traditionally in the off-season, managers, players etc are a bit more open, particularly after winning an All-Ireland. Maybe willing to sit down and have a chat, be insightful - which Jim has never done." He later added: "If you were going to beat them, it wasn't by sitting down doing interviews or giving nuggets, particularly when you were getting nothing out of their camp - either from players or management." As much as Fitzmaurice is to be admired, this is where logic leaves the room. It brings us back to the age-old misunderstanding between those playing the games and those reporting on the games. We like to see these off-season sit-downs as a return to some normalising of relationships. Still, the unhealthy view that players will perform better out of the spotlight persists. Last week, we had Odhran MacNiallais on these pages, the day before he won an Ulster Club title with 0-4 to his name. A fortnight before that, it was Ruairi Mooney of Coleraine, who scored 1-1 against Scotstown. Go another couple of weeks back and it was Neil McManus, who was man of the match in the Antrim county final the day after, scoring 0-4 in total. We might keep a record of these over the coming months for further study. By Declan Bogue There was a moment in the middle of BBC NI's 'Mná Spóirt: Croí is Anam' (Women in Sport: Heart and Soul) on Monday night when we arrived at a place of great significance.